Hospital appointment times have been reduced dramatically for scores of patients after health care assistants were trained to deliver vital heart checks to patients. Around 60 patients attending appointments at Hull Women and Children’s Hospital every month had to go to the Hull Royal Infirmary’s tower block for electrocardiograms (ECGs) to check heart rhythms and electrical activity before undergoing surgery including hysterectomy. 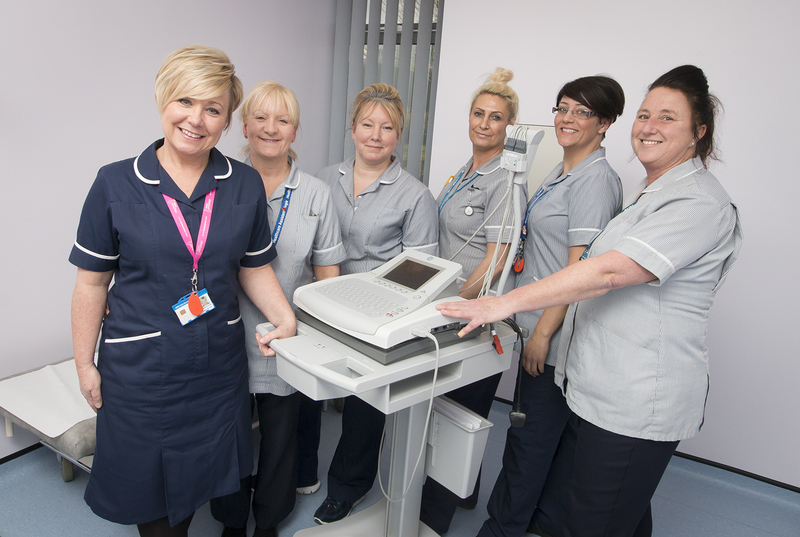 Now, health care assistants at Hull University Teaching Hospitals NHS Trust Trust have been trained to perform the checks so patients, many of them elderly and with more than one health condition, receive all pre-operation assessments under one roof. Julie Fellowes, sister for gynaecology and the breast care clinic, said the new system had reduced hospital appointment times by around 90 minutes, improving patient experience. She said: “Historically, the ECGs have been done in the ECG department in the tower block. “When our patients came in for pre-op assessments, we had to send them to the tower block if they required an ECG. The inconvenience to patients was discovered by Eileen Henderson, head of outpatient services, during a review of the main outpatient suite in the tower block. Realising the need to improve the experience for patients, staff in the gynaecology outpatients department transformed an under-used “quiet room” in the Women and Children’s Hospital into their own ECG room. Six Band 2 health care assistants have received specialised training, allowing them to carry out ECGs to appropriate professional standards. The health care assistants underwent competency core training and were then shown how to carry out ECGs before being supervised in the role. While they can carry out the tests, the results are passed to registered nurses for interpretation. Any abnormalities or concerns are then forwarded to consultants for review. The department, on the ground floor of the Women and Children’s Hospital, currently shares an ECG machine with Cedar and Rowan wards, although staff are attempting to raise £2,000 for their own machine. Reducing the length of appointment times will also benefit the trust’s “referral to treatment” or RTT performance target as it will enable staff to see more outpatients than before, reducing waiting times. Sister Fellowes said staff had worked hard to find a solution in the best interests of their patients.